After last year’s successful return of Doom, it’s clear that people still love a good ol’ balls-to-the-wall shooter. It doesn’t have to have military authenticity or an overly complex sci-fi plot, sometimes it just has to have satisfying combat and, every now and again, a bit of over-the-top gore. 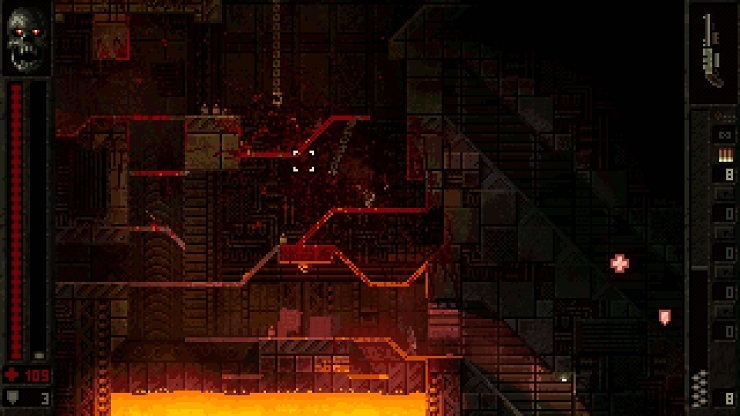 At the tail end of last year, Transhuman Design’s Butcher appeared on PC and it now comes to console, in all its blood-soaked, industrial sci-fi glory. 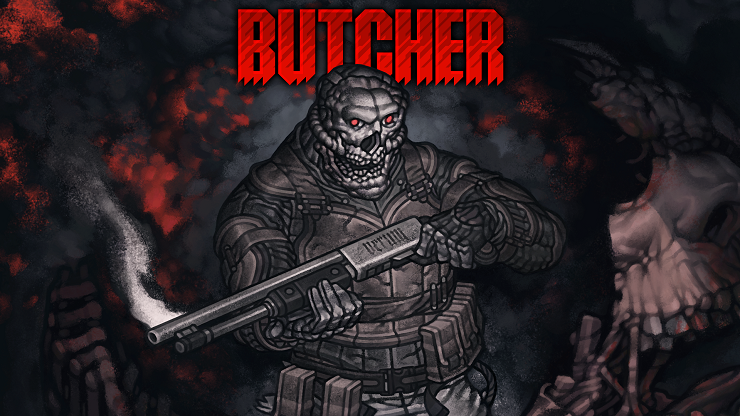 Butcher is basically a love letter to games like Doom and Quake, with no plot and no punches pulled, only in 2D. Despite its low resolution pixel art and tiny sprites, or perhaps because of those things, it’s a perfect reminder of those early days of shooters. Its grimy, rusting industrial backdrops are filled with the dark browns and reds of the original Quake, and its vicious difficulty reminded me of my first forays into id Software’s original Quake multiplayer, as staying alive for longer than thirty seconds is often a triumph. The controls are simple enough, with the left stick moving your genocidal little chap around each level, the right stick aiming in a 360° arc around him. R2 shoots, L2 jumps, Square and Triangle cycle through your available weapons, while X interacts with switches and Circle allows you to plant a boot into the stomach of regular enemies, knocking them backwards. This kick can be used in creative ways, like shoving helpless foes off a ledge and into a lava pit below, or into the path of a giant mechanical spider that just happens to have a spinning saw blade for a body. Man, that results in a messy death. Messy deaths abound in Butcher, as you might expect from a name like that. Point blank shotgun blasts reduce enemy soldiers to ketchup, but hit them from an extra step back and their torsos might be torn from their legs, entrails splaying out in a pixelated mess of pink and red. This is especially grim (or satisfying, depending on your adrenaline-addled mindset) when they’re flung onto one of the many metal hooks that hang from the ceiling, intestines and gore dangling down. If all this sounds excessive, it’s because it is, but it’s meant to be that way. Doom and Quake weren’t exactly all puppy dogs and rainbows, so of course Butcher is going to be brutal. It’s not just the enemies that die horrible deaths, either. You’ll inevitably meet your end time and time again, if you play on the default “hard” setting. Spinning blades, lava, and even piranhas will be the cause of many a bloody demise, not just bullets and explosives. 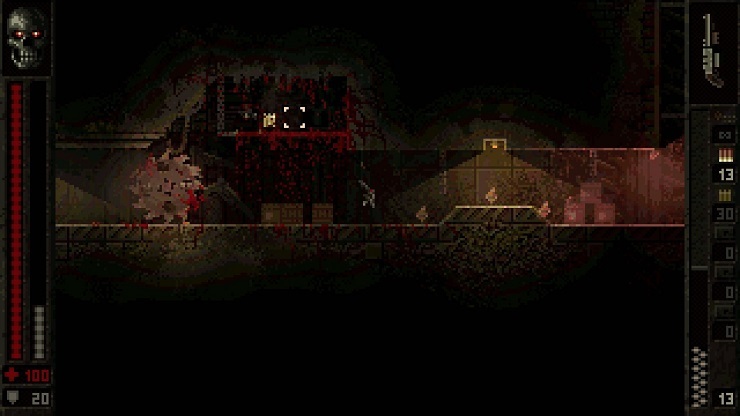 But Butcher’s levels are designed to be finished quickly, so dying is never too frustrating. Levels only tend to last for three or four minutes at a time, meaning that respawning at the beginning never loses you much progress. This means that every single encounter is fast-paced and intense, as you leap around, avoiding gunfire as you pump your enemies full of lead. Higher difficulties require more strategy and smart use of the environment, as the AI will react faster to your presence and won’t think twice about swarming you. On casual difficulty, it’s great fun to experiment and learn the layouts of each level, and you will genuinely feel a sense of reward when you move up to hard and start beating levels. I rarely believe that higher difficulty levels are worth it, but as Butcher is such a short game, it almost feels designed to be played this way. On hard and above, you’ll be forced to swap weapons regularly as ammo runs out, or simply because faster enemies require the quicker fire rate of the assault rifle, and you’ll need to do this while constantly moving. When the word “exterminate” appears on screen, you’ll soon find yourself tensing up, awaiting the incoming waves of troops with itchy trigger fingers. Brings back memories of Doom’s spawn rooms. There’s a very intelligent aiming assist that subtly helps to keep things fair too, as the console version doesn’t have the instant precision of the PC’s mouse aiming, and speed is certainly the difference between life and death in Butcher. As with any action game, the soundtrack is important, and Butcher is no different. The bassy rock keeps your blood pumping and nostalgia at its peak, as it recalls the similar tones of id’s classic shooters. The arsenal’s soundtrack is just as good, with the shotgun’s boom resounding through my headphones and the railgun’s searing ray sounds bloody glorious. Then…well, then there’s the horrendous screams of downed foes, echoing around every level as they lie in pools of their own blood and viscera, and you can’t afford to waste the ammo on giving them a merciful death. That probably sounds heartless, but again, I remind you that this game is called Butcher. Let’s not pretend that Transhuman Design ever intended for you to be merciful. Much like the games from which it draws its influences, Butcher is a triumph of fun gameplay and fast-paced action. It’s not long, clocking in at around an hour and a half, maybe two hours tops, but you will want to go back and restart it as soon as you’re done. Maybe you want to ramp up the difficulty and challenge yourself, or maybe you just want to stick it on casual and feel like a badass, but either way, you’re guaranteed to want to keep playing. 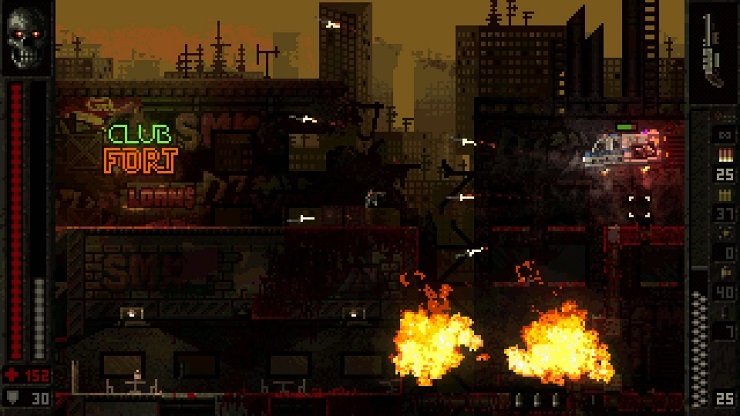 Butcher is a triumphant ode to id Software’s classic shooters, but still forges its own path. Just be careful not to slip on all the blood it spills.